I just love photographing the elk here in Pennsylvania. No matter how many times I get out in a given year, I still cannot wait to head to the mountains of Elk County to do it all over again. One would think that after so many years of photographing the elk there wouldn’t be any more shots to get. Nothing could be further from the truth! First of all, there are always new elk making their impressions on the scene. Secondly, elk are as unpredictable as any other wildlife species, so I sometimes see things I’ve never photographed before and these are now on my list. The possibilities are just endless! My favorite photographs are typically the action shots. Photographs of two bulls locking antlers, elk crossing the creek, or two cows boxing are just a few of these types of action shots. My second favorite photograph of the elk are what I call portraits. They depict the elk in their natural habitat and show a pose of the elk. I try to get a highlight or catch-light in the eye closest to the camera and try my best to portray the elk as best as possible. 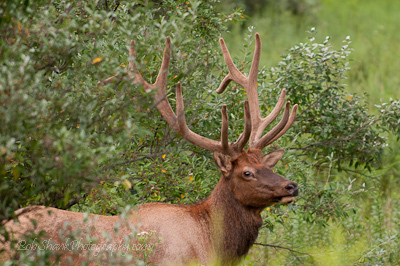 Here is one such elk portrait in today’s post. Do you think I captured a decent portrait of this bull elk?